Stephen J. DUBNER: So let’s begin. If you would, say your name and title. Richard THALER: I’m Richard Thaler. I’m a professor at the Booth School of Business at the University of Chicago. DUBNER: I see, technically, you’re called the Charles R. Walgreen Distinguished Service Professor of Behavioral Sciences, blah, blah, blah. Is that accurate? THALER: Yeah, that’s accurate, but I didn’t want to take up the whole podcast with my title. DUBNER: I understand. I was curious, however, I guess it’s an endowed chair, is that what that is? THALER: Yeah. In fact, it’s a chair that has only been held by three people, all of whom have won a certain prize. DUBNER: Interesting. More important, though, I want to know, as it’s bestowed by the Walgreen family, does the position come with a discount at Walgreens drugstores? THALER: There is no discount that I’ve been informed of. DUBNER: That said, you — and I guess the other two holders of said chair — you are about a million-plus dollars richer since you were last on the show, because I understand that you went out and won a Nobel Prize, and that they give you some money with that. THALER: Now that you mention that, I won that prize in spite of your best efforts to prevent it. I think the show owes me an apology. Like, on the air. DUBNER: This is sore winner-dom we’re seeing. You win the Nobel Prize, having been on our show previously, talking about potentially winning the Nobel Prize, and yet somehow you’re sour about our theoretically negative influence, when in fact the outcome was positive? What kind of logic is that? THALER: Well no, but it’s not the interview with me. It was the interview with Per Stromberg, where you outed me. I’m sure you guys can find the tape. Per STROMBERG: So I’m actually not allowed to talk so much about what happens. The episode was called “How to Win a Nobel Prize.” Per Stromberg is on the committee that awards the economics prize. As he pointed out, he couldn’t say too much about the secret process. But, he said, his committee was very reliant on the reports they commissioned on potential winners. STROMBERG: Our goal is to keep on scanning the field of economic sciences broadly speaking, and to keep this up to date, we continuously send out these reports, basically scanning the field. So these are super-helpful, and they’re sent to really top people in these fields who put a lot of work into these reports. So this is probably our most important input. DUBNER: And those reports remain confidential for 50 years, correct? STROMBERG: I’m not sure he was allowed to say that, but fine. DUBNER: Okay, well, that’s his problem, not mine. THALER: The show owes me an apology for trying to block my slim chances and drive them to zero. THALER: You know, it would be a line you could have used. I was holding off on the lawsuit until it was clear I hadn’t won, but I think you’re safe now, Steve, so we can move beyond this. And move beyond this we shall. Years ago, Richard Thaler became enthralled with a new line of research about decision-making by the psychologists Amos Tversky and Danny Kahneman. Thaler went on to collaborate with them, thereby helping to create the field now known as behavioral economics. To mainstream economists, Thaler’s research was often an irritant. He insisted that the elegant models they used to describe human economic activity were in fact grotesquely inelegant — because they failed to factor in how real humans actually think and decide and behave. Over time, however, Thaler’s work came to be tolerated, if not outright accepted. Along the way, he wrote a few books, including Misbehaving: The Making of Behavioral Economics and Nudge: Improving Decisions About Health, Wealth, and Happiness. Today, governments around the world are running so-called Nudge units, hoping to harness the simple power of Thaler’s ideas in the pursuit of better outcomes in health, education, personal finance, and crime reduction. Many other institutions and firms are practicing what Thaler has been preaching, often to quite substantial success. If Kahneman and Tversky were the architects of this behavior revolution, Richard Thaler was the man who turned their sketches into something we could actually inhabit. DUBNER: I have a lot of questions for you today. And we also solicited listener and reader questions. So we’ll toss them in as we go. Here’s one from Jose Albino Sanchez. He’s an economics major who graduated from Notre Dame in 2016. So: congratulations. He wants to know, “How did you, Richard Thaler, use your behavioral-economics research to not run away with the $1 million-plus prize money of the Nobel Prize and go buy a Ferrari?” And I should say, that’s assuming you didn’t do that. But I, like Jose, am curious how you used your behavioral knowledge to spend or not spend your money. DUBNER: To most economists perhaps. THALER: Well, certainly to a non-behavioral economist, it’s a silly question. DUBNER: Because the answer would be, “It just goes into the pool with the other money. It’s no different than any other.” Is that why? THALER: Right. The proceeds of that money, half of which will end up in the U.S. Treasury, are sitting in some account at Vanguard. And if I go out for a fancy dinner, there’s no way for me to label that “Nobel money.” Though that might be a fun thing to do. I’ve thought that maybe the hedonically optimal way to spend the money would be to get a special credit card, the Nobel credit card. And then when I decide to buy a ridiculously expensive set of golf clubs, hoping that that will turn me into a competent golfer, then I just whip out the Nobel card — that might be a good idea. DUBNER: Now, I’m curious. You do believe — and in fact helped identify — the notion that we think of as mental accounting, which I know that the smart people tell you you shouldn’t do. You shouldn’t set aside money for vacation or for a certain project, because money is fungible. That’s one of the beauties of money. And yet, as you discovered, many people do it. And, you also argued, it’s not such a bad idea. Or, at least, since so many people do it, we should figure out how to deal with it. But is there a cookie jar on the counter where you’ve got the half a million that you can dip into whenever you want to do something fun? DUBNER: And what’s your address, by the way? THALER: Especially if we announce it on the radio! DUBNER: But why just stick it in Vanguard, where it just becomes more dollars mixed in with the others? THALER: Well, I’ve been busy, Steve, you’re getting me to think about labeling it. And, of course, maybe we should figure out what percentage, maybe all, should go to some cause. That would make me feel good, too. DUBNER: If there were a cause, can you tell us just the general outlines of the cause? Would it be poverty alleviation? THALER: You know, I greatly admire Doctors Without Borders. And they are one of the causes that we support. But I haven’t really figured out what my personal cause is. DUBNER: Now, let me ask you this. Your wife, France, you’ve been married quite a while. I don’t know how much credit you give her for being part of the familial team that produced this Nobel Prize. If you were to divide the prize, how do you think about divvying that up? THALER: First you try to prevent me from winning the Nobel Prize. Now you try to break up my marriage, Steve. You know, I used to think of you as a friend. I would say that France should get 120 percent of the after-tax money. THALER: And you should get -20 percent. And I think that would be a great solution. DUBNER: Early in your academic career — and I hope you don’t mind me saying this — it didn’t appear as if you were destined for huge distinction in your field. THALER: I think that’s fair. DUBNER: The undergraduate and graduate schools you went to aren’t quite elite. Your place in the economic firmament was hardly guaranteed. So what happened? How’d that guy get to here? THALER: So, you’re right. I don’t think I was — well, I certainly wasn’t a great student. And I don’t think I was a great economist, in the way economists are usually judged, in the sense that I wasn’t a great mathematician and my econometrics skills were not superb. Suppose there was an economics combine, like the N.F.L. combine, and they did all the stats on Thaler. No one would have drafted him. And so what I really ended up having to do to survive — and this sounds premeditated, and of course it wasn’t — was to figure out a kind of way of doing economics that would be something I was good at. And had I not done that, I might well have not gotten tenure and gone off and maybe I would be competing with you in book writing. DUBNER: You’ve summed up behavioral economics as a collection of “supposedly irrelevant factors that, when it comes to how people actually live their lives, are in fact not irrelevant.” Can you give an example? THALER: Sure. One of the first things that I noticed back when I was a graduate student puzzling through the behavior I saw, was that people don’t follow the economists’ advice to ignore sunk costs. If you paid for some expensive, rich dessert and after one bite you were already full, and your waistline doesn’t really need it, but you remember how much you paid for it, and so you think you need to eat it, following all kinds of mothers’ bad advice to finish what’s on your plate – then you are failing to follow the economist’s advice of ignoring that money, because eating it doesn’t get the money back. So, sunk costs are something that economists predict will have no effect on behavior. And there are a class of these supposedly irrelevant factors. In fact, it’s almost the only set of things about which economists have precise predictions. Consider supply and demand. If the price goes up, people will demand less. Well, how much less? “Oh sorry, the theory doesn’t specify that.” All it says is: less. Whereas here, sunk costs will matter precisely zero. DUBNER: So says the theory, at least. THALER: Says the theory, right. DUBNER: In reality, you’re saying they matter a great deal. THALER: Right. That’s why I call them supposedly irrelevant factors. Another example is default options, which box is ticked on a form. Again, according to economic theory, the cost of clicking the other box is infinitesimal. And yet we know that making enrollment in a retirement plan the default option increases enrollment rates to over 90 percent. And so again, economists would predict confidently that that would have a zero effect, and it has a massive effect. In an earlier episode of this podcast, called “How to Launch a Behavior-Change Revolution,” we heard Danny Kahneman — who won his own Nobel Prize in 2002 — describe the history of behavioral economics. He pointed out something that distinguished Richard Thaler from many other economists. Daniel KAHNEMAN: Now, Richard, he hates my saying the next two things I’ll say about him. One of them I think he would tolerate. I think he’s a genius. That one he accepts. I think he’s lazy. I’ve made him famous for being lazy. DUBNER: You’ve been accused — or really, praised — by your collaborator and mentor and friend Danny Kahneman as being extremely lazy, and furthermore he argues that laziness has in fact been a big part of your success. What does he mean by that, and should we all try to be a little bit lazier? THALER: Well, I don’t know whether I can recommend laziness. Danny insists in great earnestness that this was intended as a compliment. He described it as my best feature. And I object to that. I concede some laziness, but that being my best feature? Really, Danny? So I think what he means is that — at least I’m going to interpret it this way — that I have little patience for working on things that aren’t, at least to me, both interesting and somewhat important. And so compared to too many economists or academics, I haven’t written a super large number of papers, and I don’t follow the habit of writing 20 versions of the same paper, or on the same topic, because I get bored. And the fourth paper on some topic is not nearly as interesting as the first one. So Danny claims that it’s my laziness that forces me to work on things that are important rather than unimportant. And that’s his story, anyway. DUBNER: And the mechanism of that benefit is what? Because you’re lazy, you just don’t want to waste time on things that aren’t going to be potentially important and/or interesting? THALER: Yeah, that’s the idea. DUBNER: So, I hate to inject our personal history in this, but it does bring up a memory. I remember coming to visit you in Chicago. I think it was the first time we met. And it was probably 15, 16 years ago, and I had really fallen hard for this whole behavioral idea, the Kahneman/Tversky, and Thaler, and I liked the economics. I especially liked the psychology. And I came to you and I said, “Herr Professor Thaler, I — a young and ambitious journalist at The New York Times — would be most interested in writing a book that incorporates your research and incorporates your own view of the world, and I’d love to include you in it as some kind of collaborator, subject,” so on. And if I recall correctly — I’m just curious to know what your recollection is — you basically said, “That sounds like a lot of work. And I’ve got other stuff going on, so I’ll buy you lunch but then, scram.” That was my recollection. And I’ve always been disappointed that we never worked on a book together. I’m curious if that squares with your recollection. THALER: Yeah, it really is too bad for you, because when you got done with me, you said, “I’m going over to the Economics Department to talk to this young guy Levitt.” And then I think you abandoned the idea of writing a book with me, because sumo wrestlers are more important than mental accounting. But my recollection of the story was that I thought maybe I had a book in me. And eventually I did. DUBNER: Obviously, you did. You had two more, and maybe more beyond. THALER: So, this is the tallest-midget theory, but by economists’ standards, I write well. And so yeah, I thought that maybe I should write a book. And that it should probably be in my voice. And it worked out well for all three of us. DUBNER: I do agree you write well — not even for an economist. You’re a good writer, but in economics it especially stands out. I read a piece of yours recently that I would recommend to everybody. It was published in, I believe, J.P.E. — Journal of Political Economy — and it was an essay about the history of behavioral economics. And this was so interesting to me. You write that it nearly got fully underway at the University of Chicago about 100 years ago, but didn’t catch on. Can you talk a little bit about that? THALER: Yeah, so the background is, the University of Chicago house journal, the Journal of Political Economy, one of the top five journals in the world — they were celebrating their 125th anniversary, and they asked a bunch of Chicago faculty members to write short essays on their field and how it’s been represented in the journal. And for behavioral economics, there were pretty slim pickings. But there was this article written exactly 100 years ago in 1918 by a guy called John Maurice Clark. He was the son of a more famous guy, John Bates Clark, for whom an award is named. And he writes something like, the economist can try to invent his own psychology, but it will be bad psychology, and if they want to stick to economics, they should borrow their psychology from psychologists. DUBNER: Clark, you write, ends up leaving Chicago for Columbia. And you write, “it seems fair to say that the subsequent editors of the J.P.E. did not take up his call to arms,” which was essentially to integrate psychology and economics. Why did it take so long, do you think? THALER: Well, I don’t know really what was going on in 1918, but it is the case that economics was behavioral. Adam Smith was a behavioral economist, for sure. And Keynes was a behavioral economist. The single best chapter on behavioral finance was written by John Maynard Keynes in The General Theory, which was written in 1936. So I think until World War II, there wasn’t something called “behavioral economics,” but economics was kind of behavioral. And then what happened is, there was a mathematical revolution that took place right after World War II. And it was led by people like Paul Samuelson and Kenneth Arrow. And Samuelson in particular, he was a University of Chicago undergraduate, and then went off to graduate school, and his thesis was called Foundations of Economic Analysis. So all he did was redo all of economics properly. And so starting with that, economists got busy writing down Greek letters and formalizing economics. And it turns out the easiest way to do that is to describe behavior as some kind of optimization problem. Because if you’ve taken a high-school calculus class, then you know how to solve for the maximum: you take the first derivative and set it equal to zero, and you’re done. So it was the bounded rationality of economists, ironically, that led them to make everything rational. DUBNER: It’s interesting, because a lot of the hallmark anomalies identified in recent decades by people like you and Kahneman and Tversky — we talk about loss aversion and mental accounting, and the endowment effect; and all the cognitive biases: recency bias and status-quo bias, and the availability bias — it strikes me that none of them actually even seem remotely new. THALER: I think it’s the sort of thing that your mother might say, “Really? You make a living doing that?” Much less a Nobel Prize? So I guess it’s fair to say that just pointing out that people aren’t all that smart would not get you a Nobel Prize. You had to do something with it. And that turned out to be more work than I liked. But there was a long debate. And by no means have I convinced everyone. DUBNER: Well, you were once asked about the degree to which, quote, “mainstream economists” have embraced behavioral economics. And you said, “I don’t think I’ve changed anyone’s mind in 40 years. You basically don’t change minds. Given that, I’ve turned to the strategy of corrupting the youth.” And indeed, there are a lot of young economists really interested in behavioral stuff. Is that really true? Did you really change no minds? And, if so — or even if not, I guess — what have you learned about the human capacity to change a mind? I mean, we don’t want to just write off anyone over the age of 25, do we, as incapable of entertaining new thoughts? DUBNER: It’s interesting though, because if you look at the world writ large, political systems and healthcare institutions, and so on — isn’t that exactly the same core problem that we’re facing? Which is, people come along with what could be really useful solutions but, institutions being what they are, the people with the power to change have often the least incentive to change. Isn’t that a huge issue in the lack of progress? THALER: Well, I get what you’re saying, which is, if I’m at the top of the heap, why do I need to change? But on the other hand, it’s often the C.E.O. that is the most reluctant to change, and that guy — and he’s unfortunately still usually a guy — potentially has a lot to gain from changing. If you think of companies that have come and gone, like Kodak, which invented the digital camera, but they had an almost-monopoly in film, and didn’t really think this digital thing would go anywhere. Blockbuster Video, which came along and put tens of thousands of mom-and-pop video stores out of business, only to be put out of business by Netflix. 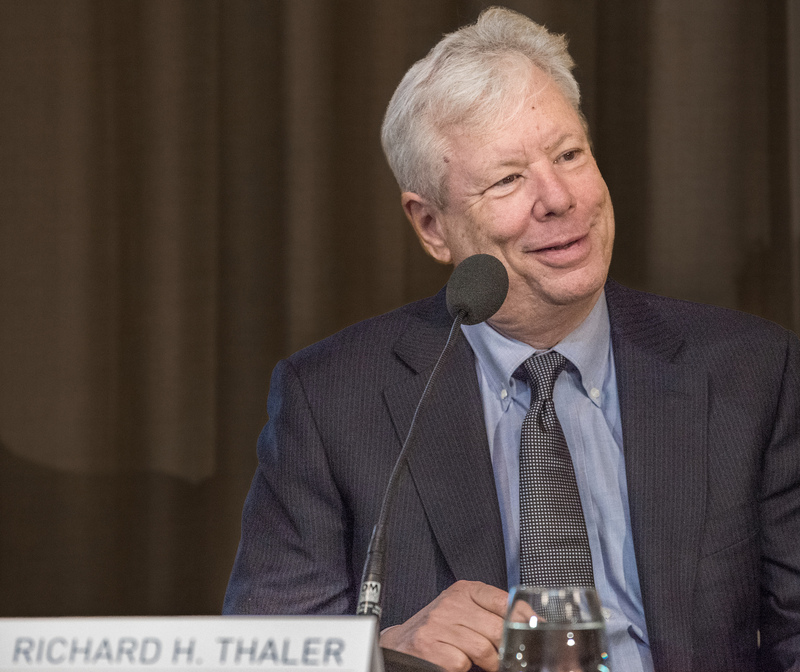 In December of 2017, Richard Thaler went to Stockholm for a multitude of Nobel festivities. THALER: At the Nobel Prize banquet, one winner from each prize has to give a toast. It gives you a glimpse of the grandeur. ANNOUNCER (TRANSLATED FROM SWEDISH): It is a great honor to introduce the laureate of the Sveriges Riksbank Prize in Economics in Memory of Alfred Nobel: Professor Richard Thaler. THALER: So my toast began by saying that my fellow winners had discovered things like gravitational waves, and circadian rhythms. And I discovered the existence of humans in the economy. Then there were other events, including the Nobel lecture. Magnus JOHANNESSON: Professor Thaler, please, the stage is yours. THALER: Thanks to all the members of the committee. And thanks for that great introduction. So, I’ve been interested in gravitational waves for a long time—oh no! Steve LEVITT: [From “How to Win a Nobel Prize”] The way I know it’s Nobel season is that around Chicago, a lot of people tend to get haircuts in the few days leading up to the announcement of the prize. And so if I see all my colleagues with really short and well-maintained hair, I know that the prize must be somewhere right about the corner. THALER: No, I didn’t. And I will also say that I have heard of economists and other scientists who set their alarm. DUBNER: And then do they practice sounding sleepy? THALER: — like 3:45 — so that they’ll be alert, which I was the opposite of when the phone rang. And I’m a good enough amateur psychologist to know that this is a horrible idea, a really dreadful idea. So, let’s suppose my chances of winning were one in 20. Setting my alarm gives me a 95 percent chance of being awake to get the bad news. Whereas my strategy had always been to sleep soundly and then hear on NPR in the morning or now, breaking news on your phone, “Oh, isn’t that nice that Jean Tirole, a fabulous fellow, won the Nobel Prize?” And you can be happy about that. So, no, I didn’t get a haircut, and my alarm was not set. THALER: [At University of Chicago post-Nobel conference] And unlike Bob Dylan, I do plan to go to Stockholm. THALER: You know, it’s a pretty good substitute. And I will say, the Nobel Foundation makes exactly no distinction. So, you’re all treated the same way. But, because of this order, I spent a lot of time standing in lines and sitting next to Kazuo Ishiguro, the Literature winner, who was charming and wonderful. But I will say that I found the whole thing to be pretty emotional, partly because of where I came from intellectually. So, as we were saying, I’m not someone that you would have predicted would be a Nobel Prize winner. And when that finally happened, it was an emotional experience. DUBNER: Are either of your parents still alive? THALER: No. They’re very slow. DUBNER: They, the Nobel Committee, you’re talking about. THALER: Yeah, the Nobel committee — they’re working their way through the 1980’s. So that means that people are typically in their late 60’s and early 70’s when they win the Nobel Prize, which means there are very few parents that get to see their children win. DUBNER: Who do you think was most proud of you? THALER: Danny Kahneman. Well, he was happiest. He kept telling me, “Come on, win this before I die!” And he’s 84, and he’s a friend, so I had to do it. The bribes were finally well worth it. DUBNER: So let’s move on to talking about how behavioral economics has been applied by various people in various intensities in many different places around the world. You’ve said there are roughly 75 what are called “Nudge units” named after your and Cass Sunstein’s book Nudge, about using behavioral economics in policy, essentially. Policy-making. THALER: The latest number is 200. DUBNER: Goodness gracious, that’s a tripling in what span of time, just a year or two? THALER: Cities — there’s one in Chicago, for example. DUBNER: Alright, but what would you say to date has been the greatest kind of specific contribution of behavioral economics? In other words, the greatest instance in which the research and the ideas have been applied to policy in successful measures? THALER: I guess you’d have to say retirement saving plans. Because 401(k) plans and their ilk — defined-contribution plans — have really been transformed because of behavioral-economics research, on two dimensions. One is changing the default, so what’s called automatic enrollment. So you’re in unless you actively take some step to opt out. That has gotten enrollment rates to be north of 90 percent. And then what my colleague Shlomo Benartzi and I called “Save More Tomorrow,” which is a plan where you ask people if they want to increase their saving rates every year until they hit some reasonable level. The generic version of that is now called automatic escalation. DUBNER: So what that means is, you get a raise and you contribute a higher percentage, but because you’re getting a raise, you still are bringing home a little bit more money and you don’t feel the pain, is that the idea? THALER: Right. And you commit yourself to this off in the future, because we all have more self-control next month, when we’re going to start going to the gym every morning at 6:00. DUBNER: You’ve written that “the subfield of economics in which the behavioral approach has had the greatest impact is finance.” I’d love you to talk about that for a minute. One thing I’ve never understood about behavioral finance is: once the notion of behavioral anomalies is widely accepted — and they seemed to be, now, in finance and in investing — aren’t they just subsequently priced out of the market? THALER: Well, that’s an interesting question. And the answer is, to some extent, yes. But I’ve been involved with a money-management firm, called Fuller and Thaler, that’s been around for 25 years or so. And the things we do don’t seem to work any less well than they did 20 years ago. DUBNER: I know Fuller and Thaler describes itself as having “pioneered the application of behavioral finance to investment management.” In what ways is the firm’s strategy actually behavioral? THALER: So we’re explicitly thinking about, what are a class of situations in which people are likely to make a mistake? So it’s like, you go into some restaurant and somebody is leading you to your table, and there’s that one step down, and they say, “watch your step.” And they say that because if they don’t, three people a night will fall down, and they’ll have lawsuits. So, you can be a spectator watching that and say, “Oh, that guy’s about to make a mistake.” Now, you would have made that mistake, too. So, what we try to do is find those steps that are not quite in sight that will throw a majority of market participants off. DUBNER: Let me ask you a related question. This is from Colm Ryan, who writes that he’s an accountant in Dublin, Ireland. Related to what we’ve been speaking about, with very high stakes, I should say. So here’s his question: “Given that you could apply behavioral principles to help understand what led to the 2007 crash, do you see any similarities, or, indeed, differences in what’s going on in the world today?” And before we let you answer the question, we should say that you, Richard Thaler, would seem particularly well-suited to answer this difficult question because in the film The Big Short, Selena Gomez helps you explain synthetic C.D.O.’s — collateralized debt obligations. Selena GOMEZ: Okay, so here is how a synthetic C.D.O. works. Let’s say I bet $10 million on a blackjack hand. THALER: $10 million because this hand is meant to represent a single mortgage bond. DUBNER: So first of all, was she a pretty good teacher? You understood C.D.O.’s better after that filming? THALER: Yeah, let me just say that Selena, unlike me, was very good at memorizing lines. And I think it’s fair to say — she was a very charming young woman, and I’m deeply grateful to her because being in that movie is the only thing that I’ve done that has impressed my granddaughters, who are big Selena Gomez fans — but I think it’s fair to say, Selena knew nothing about collateralized debt obligations nor blackjack. DUBNER: So she’s a great actress, then, because the impression is, she knows quite a bit about both. THALER: Yeah, she’s much better actor than me. And so a possibly funny story is that in the script, the first hand, she’s dealt a 21, which of course in blackjack means you win. And she was dealt 21 and didn’t react. And so I had to take over as blackjack coach and director — both of which are uncredited in the movie, I might add — and say, “Selena, when you get dealt 21, that means you win.” And there’s a shot in there where we’re high five-ing, and that’s because she had learned in subsequent takes that when she gets dealt 21, that she’s supposed to be happy. DUBNER: Okay, so let’s get back to Colm Ryan’s question about the 2007 meltdown and now — similarities? Differences? What do you see? DUBNER: Of which you’re not a fan, we should say. THALER: Of which I’m not a fan. DUBNER: You’re not not a fan of blockchain itself, correct? But as a currency, not a fan. Is that about right? DUBNER: So have you shorted Bitcoin? THALER: No, because Warren Buffett says a lot of smart things, and one of the things he says is, don’t make investments in things you don’t understand. And I have no clue. I don’t think that the intrinsic value of Bitcoin is worth thousands of dollars. But I also think it’s entirely possible that it will go up rather than down. So “stay away” is the best advice. DUBNER: Some people, including some economists, argue that behavioral economics is really just another way to suggest that individuals can’t be trusted to make good decisions. And so institutions, particularly the state, should take more control. Indeed, your co-author on the book Nudge, the legal scholar Cass Sunstein, for several years ran a White House unit called the Office of Information and Regulatory Affairs, which sounds about as Orwellian as you can. There are “Nudge units” in dozens of federal governments around the world. You’ve described your work as libertarian paternalism, and, furthermore, argued that that phrase is not an oxymoron. Why shouldn’t we dismiss your work as a kind of new, softer form of statism? THALER: Well, first of all, when we use this phrase libertarian paternalism, we’re using libertarian as an adjective. And so we’re trying to say we’re going to design policies that don’t force anyone to do anything. So the claim that we’re trying to tell people what to do, or force them to do things, is just completely wrong. We are also not trying to tell them to do what we think is smart. We’re trying to help people do what they want to do. I like to use G.P.S. as an analogy of what we’re trying to do. So, I have a terrible sense of direction. And Google Maps is a lifesaver for me. Now, if I want to go visit you, I can plug in your address, and suppose I’m walking across the park, and I see, “Oh, there’s a softball game over there. I think I’ll go watch that for a while,” Google Maps doesn’t scold me. It will re-compute a new route if I’ve gone a bit out of my way. It doesn’t suggest addresses to me. It just suggests a route. And if there’s a traffic jam, it suggests maybe you should alter your route. So, we don’t think people are dumb. We think the world is hard. I mean, figuring out how much to save for retirement is a really hard cognitive problem that very few economists have solved for themselves. And it’s not only cognitively hard, it involves delay of gratification, which people find hard. It’s just like navigating in a strange city is hard. So, why not try to help? When I first was working with the U.K. Behavioral Insight Team, the first “Nudge unit,” the phrase I kept saying in every meeting with some minister was, “If you want to get people to do something, make it easy. Remove the barriers.” That’s what we’re about. DUBNER: Let me go back to you and the Nobel. So, what would you say have been the biggest changes in your life since winning the prize? Both of the observable sort and unobservable? THALER: Well, I think I spend more time talking to people like you. My inbox, my email, is completely out of control. And there are some downsides. The university all of a sudden has a lot of things that they would like you to do. THALER: Of that ilk. So, I was a pretty happy guy. You’ve known me for years. And we saw each other recently. Did I seem demonstrably happier? DUBNER: You looked a little taller and better-looking, but otherwise — I think that was my perception. I think you were exactly the same, actually. THALER: No, that was just your jealousy. But look, I absolutely don’t want to sound like a sore winner or an ungrateful winner. I’m saying that most of the people who win were already pretty successful people with pretty good lives. And there’s what psychologists call a ceiling effect. So I had a pretty happy life, as you know, I have a nice wife and I have kids I love. And yes, this made me happy. And it was very gratifying. But you have this image that you’re going to be on cloud nine. And then there is life, you still get flat tires even if you have a Nobel Prize. You still have leaks at home that nobody seems to be able to fix. So they need to fix that and say that if you get a Nobel Prize, nothing can leak in your house. DUBNER: I’ll end with where I should have started. Congratulations. DUBNER: I know everybody who listens to you is happy for you, proud of you, and most of all, we’re pleased in a selfish way to keep learning from you, because we learn a lot. And I thank you especially for that. And I look forward to the next time we speak. Freakonomics Radio is produced by Stitcher and Dubner Productions. This episode was produced by Greg Rosalsky. Our staff also includes Alison Hockenberry, Harry Huggins, Greg Rippin, and Andy Meisenheimer. The music you hear throughout the episode was composed by Luis Guerra. You can subscribe to Freakonomics Radio on Apple Podcasts, Stitcher, or wherever you get your podcasts. Richard Thaler, professor of behavioral science and economics at the University of Chicago. “Behavioral Economics,” by Richard Thaler (The Past, Present, and Future of Economics: A Celebration of the 125-Year Anniversary of the JPE and of Chicago Economics, December 2017). Misbehaving: The Making of Behavioral Economics, by Richard Thaler (2016). Nudge: Improving Decisions About Health, Wealth, and Happiness by Richard Thaler and Cass Sunstein (2009).